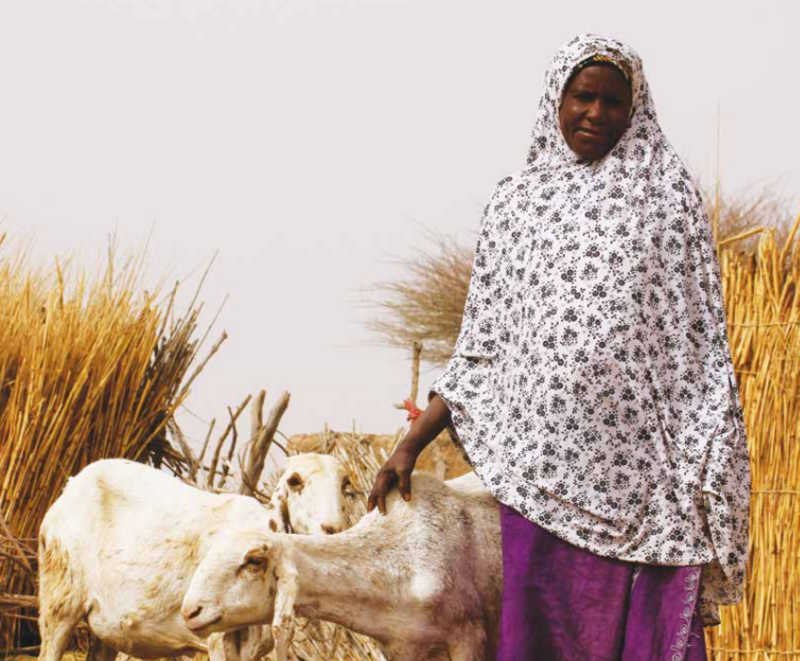 From the front cover of the brief: Mariam Chaibou of Maigochi village in Niger with the two of the four goats she has received through ALP’s small ruminants scheme. Rural communities in Africa are increasingly confronted with the realities of climate change. Poor women, men and children living in these communities experience increased vulnerability, uncertainty and risk, bringing new and evolving challenges to securing their livelihoods and moving out of poverty. Community-Based Adaptation (CBA) supports such communities to understand the changes they face and take informed and appropriate actions that result in climate resilient development on an ongoing basis. The Adaptation Learning Programme's (ALP) Community Adaptation Action Planning (CAAP) process has proven to be a key approach for building motivation and capacity for action on CBA among communities, while also strengthening community participation and influence in local government decision-making. The brief* provides a conceptual overview of ALP's Community Adaptation Action Planning (CAAP) process, as well as explanations and examples of how it works in practice, based on ALP experiences in Ghana and Niger. It describes how to progress from climate vulnerability and capacity assessments in a participatory community planning process. ALP community plans focused on livelihoods and natural resource issues, but the CAAP process described applies for addressing all climate sensitive sectors, for example health, education, energy, or social safety nets. It is designed for CBA practitioners, including local government representatives, civil society organisations (CSOs) and other actors working on climate change issues at the local level. It will also be useful for policymakers and donors engaged in planning and allocation of resources for adaptation action. *download this practitioner brief from the right-hand column or via the links provided under Further Resources. A quick-look overview of the CAAP process and the contents of the brief are provided below. Participation is key to the CAAP process. The core of the process involves four steps that foster community participation, shown in green in the diagram. These steps aim to empower communities and build their ownership of adaptation plans and actions. A key element of the process is the iterative, learning-based approach that is demonstrated by the feedback loop from participatory analysis, through planning, implementation and adaptive management of the plans. This reflects the nature of adaptation as a flexible and continuous process of analysis, planning and action over time, informed by climate information. While communities are at the centre of the process, the participation of other local stakeholders is also necessary. Three additional steps, shown in blue, focus on establishing the initial process and the linkages between community-level activities and other levels, including local government development processes and broader systems and policies. Some of these actors may also be involved in the four community-led steps to enable mutual understanding. These linkages focus on creating an enabling environment for planning and implementation of community adaptation actions, which is important for effectiveness and sustainability of the CAAP process. In some contexts, further analysis and stakeholder mobilisation may be required to support the other steps, as shown by the dotted arrow in the diagram. Why use the CAAP process? Builds on existing good practices for participatory community-based planning, but places a focus on integrating local knowledge of climate change with scientific information on future trends. Strengthens community empowerment, ownership and equality. These are fundamental to realising sustainable adaptation which is inclusive of the most vulnerable people. Is a flexible and future-orientated approach to planning. It helps communities to make better informed and equitable livelihood choices on an ongoing basis that anticipate and respond to risks and changes. Improves (through the adaptive capacity developed) local governance and enables a dynamic response to current and future climate risks at the local level, ultimately delivering climate resilient development. Represents "value for money": climate investments become directly relevant to local needs and interests due to the focus on locally owned decisions and actions, thus helping to avoid maladaptation or irrelevant investments. With inclusion of CAAPs as a critical element, community based adaptation as a whole has been shown to be cost effective economically, socially and environmentally with positive cost benefit ratios under almost all potential climate scenarios, including when the climate is favourable. If the mechanisms for delivery are designed appropriately, the emerging sources of adaptation finance, such as the Adaptation Fund and the Green Climate Fund, represent an important opportunity to support community-level planning and action, as well as to strengthen systems and institutions to enable CBA over time. Equally, CAAPs enable investment from government development budgets and bilateral donor programmes. Coordinated efforts are essential for integrating adaptation into development planning and programs to ensure that development is locally determined, climate-resilient, strengthens local adaptive capacity and incorporates risk management. The learning from CAAP processes provides important evidence to inform these efforts. Step 1: Launching the community adaptation action planning process. Step 2: Context analysis and stakeholder mobilisation. Step 3: Participatory analysis of climate change vulnerability and adaptive capacity. Step 4: Development of community adaptation action plans. Step 5: Implementation and adaptive management of community adaptation action plans. Step 6: Integration of community priorities in local development planning. Step 7: Strengthening systems and institutions. This publication was authored by Angie Dazé in collaboration with Fiona Percy and Nicola Ward. It is based on valuable content provided by Romanus Gyang and Awaiss Yahaya and their reflections on applying the CAAP approach as part of implementing CBA with the Adaptation Learning Programme in Ghana and Niger. The document has benefitted from contributions from many other colleagues, including all ALP team staff, Karl Deering, Rolf Herno, Stefan Mielke, Maureen Miruka, and Bob Wagner. The author and ALP would also like to thank CARE’s Poverty, Environment and Climate Change Network (PECCN) and CARE Danmark for their support, and all of the dedicated and inspiring CARE project staff and partners involved in the approaches outlined in this brief, the authors of the various CARE publications referenced, and Catherine Mackenzie for her initial work in outlining the community based planning process.